OurHome Studio has two artists. JoshuaE is 35 years old and the studio came into existence to meet his needs. Birth trauma left him with cerebral palsy so anything he does requires great effort. Little did I know he would want to become an artist. I discovered his ability when I started taking a watercolor class. I’m the other half of OurHome Studio. My name is Carol, aka C.L. Roth when I’m wearing my author hat, and I’m Joshua’s mother. I’m also his guardian and his caregiver. As any caregiver knows being on call twenty-four hours a day seven days a week is a tough job. My son was in his mid-teens when I took the painting class. I soon found out Joshua wanted to paint. I gave him paint, and paper, expecting him to finger paint. He painted two or three pictures then proceeded to throw one of the biggest tantrums I’d ever seen from him. He threw an angry, foot kicking, tantrum.Did I forget to mention that Joshua is non-verbal? He was certainly vocal that day. He let me know, in no uncertain terms, he wanted to paint and he wanted to paint with a brush. I’ve written about this story before so I’m not going to repeat myself. The focus of this blog is a different matter. I want to talk about what happens when a disabled person, and his caregiver, have equally important goals. How do we figure out how to equalize, and prioritize, each of our needs? Taking care of Joshua is a job I can’t slack on. His self-help needs are non-negotiable. They need done and I’m the one who does them. Taking care of Joshua’s physical needs takes a good portion of the day so any hours left for hobbies, or as I like to call them, jobs, are limited. If I don’t take hours for myself I don’t get them. Its the same for Joshua. If I don’t give him the hours he requires then he doesn’t get to paint. Splitting the time can get frustrating for both of us. We’ve tried different methods of sharing. We tried doing every other day but that doesn’t work for us. I invariably get side-tracked and neither of us gets work done. The most useful method has been a kitchen timer. I turn off the TV. I set the timer for 1 hour and during that hour Joshua has my undivided attention. When the timer rings, then the time is mine, and Joshua gives me one hour of peace. Sometimes, he sits by me and gives me the benefit of his sense of color. Sometimes, he chooses to work on his Tobii (an augmentative communication computer). 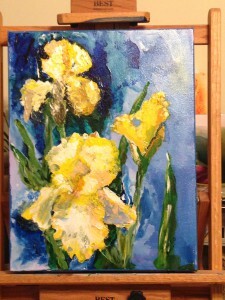 I’m sharing two paintings. 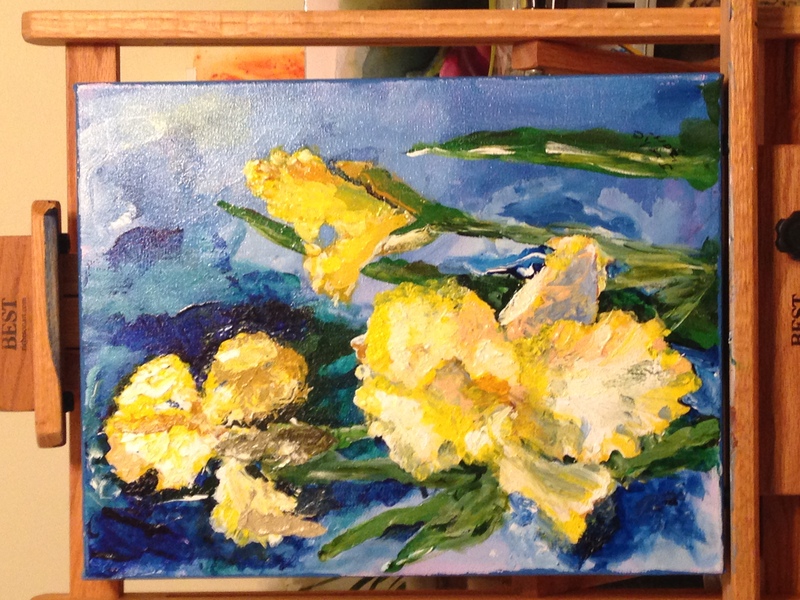 Yellow iris (above) was painted by Joshua E. He had a hard time with this one. It started out purple, then went through a blue phase, and finally yellow. 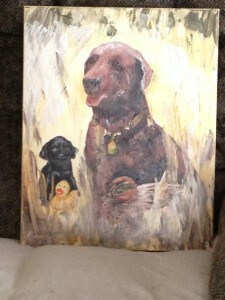 And one of my recent paintings.It is #1 in my Rubber Ducky series. Thank you, Nita. I’m trying to get the websites to function more efficiently. I’m really glad you left a comment so I know this function works. We have a lot of fun and interesting projects coming soon.